If you’re anything like us you are tired of the snow and are ready for flowers and sunshine! This year has brought record amounts of snow to parts of the country but spring is just around the corner. It’s sometimes hard to remember at this point in the year but a fresh snow fall is stunningly beautiful as is this subtle yet elegant décor piece from Tafelstern. 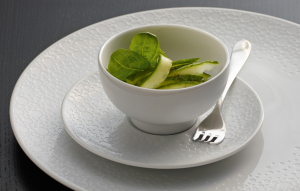 For April’s exercise we chose this handless cream soup cup from Tafelstern’s Avantgarde collection decorated in snow. The ingenious aspect is in the shallow, globular depressions that can be felt by the fingertips. The snow decor is completely glazed leaving a glossy finish. The end result is stunning. So join us in one last celebration of snow as we say goodbye to winter and welcome spring with open arms.